USD’s Student Government Association was joined by the eight deans of their respective colleges at their weekly Tuesday meeting. Each dean was able to talk about their college’s success and the issues their college is facing. Senate was then able to ask the deans questions. Thomas Geu, dean of the law school, talked briefly about the 3 + 3 fast track program offered by the law school. This program allows qualified students the ability to start their law school education as early as their senior year of undergraduate studies. Kevin Huizenga, SGA senator, said he was unaware of this program prior to the dean’s forum. He said the dean’s forum was a great opportunity to become more aware of what is happening in other colleges at USD. By being able to hear of programs available in other colleges, Huizenga said he hopes SGA senators, himself included, will be able to bring forward new ideas to improve their respective colleges. Sidney Juffer, SGA senator, said she hopes this session will inspire senators to listen and understand the differences in every college on campus as a way to improve the university as a whole. Josh Sorbe, SGA president, said being able to sit in front of all eight deans and ask them questions is the “definition of transparency,” and he hopes Senate can relay the information they gathered tonight to educate the larger student body. 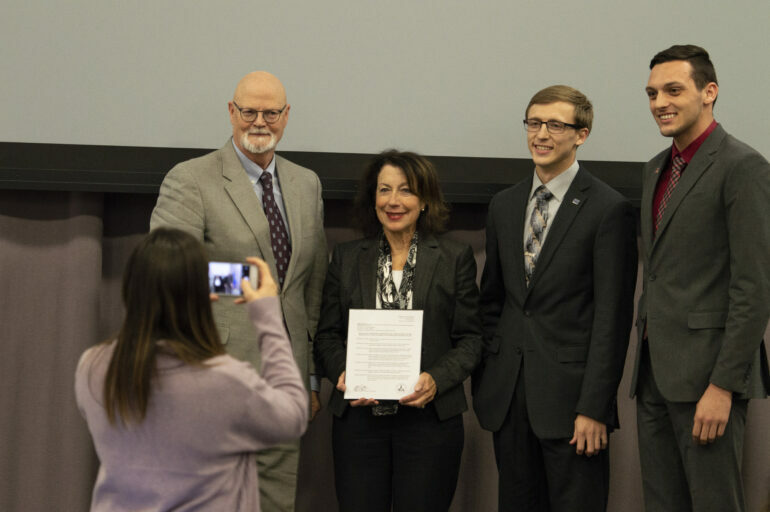 Senate also passed Senate Resolution 10 at Tuesday’s meeting, a resolution to commend the work of Mary Hutton, a professor at the school of law. Senate was also introduced resolution 8, which addresses the General Activity Fees funds for the theater department, and the audit for student organizations. Both resolutions will be seen again at SGA’s next meeting on Nov. 26.